Unhappy franchise owners claim that Eric Stites, Michelle Rowan and Franchise Business Review are misrepresenting their satisfaction and are knowingly promoting an unethical and failing franchise opportunity as a “Top Franchise for 2017 by franchisee satisfaction.” Eric Stites admitted that they are the promoting MODE franchise’s year-old positive data, not its 2-month old negative data. And he promised to remove MODE from FBR’s franchise rankings… but hasn’t. (UnhappyFranchisee.Com) Is Franchise Business Review a legitimate franchise market research firm that objectively publishes and ranks franchises by the satisfaction of their franchisees… without payment or influence from the franchisor? Did Franchise Business Review apply a scientific methodology in gathering and presenting accurate franchisee opinion data on the MODE franchise so that prospective franchise buyers would have accurate, objective facts? Or is Franchise Business Review knowingly distributing an undeserved award and endorsement that will deceive prospective buyers into thinking one of the most troubled franchises in the country is actually one of the best? Franchisees of the struggling MODE retail franchise claim clearly believe the latter, and are claiming that their “satisfaction” is knowingly being misrepresented by Franchise Business Review, its CEO Eric Stites and FBR President Michelle Rowan. The fledgling MODE retail chain has opened 14 MODE stores opened, including 2 company stores and 12 franchises. 7 MODE stores (50%) appear to have closed and not reopened. 2 more appear to have been reacquired by the franchisor. That’s 9 out of 14 MODE stores gone wrong – putting the current failure rate (arguably) at about 65%. One franchisee is in litigation with franchisor Mama Mia, Inc.
At least one more may be filing a lawsuit soon. While franchisor President Ciara Stockeland travels the country sharing her success story and providing franchising tips, MODE franchisees report collective losses in the millions of dollars. When UnhappyFranchisee.Com asked CEO Eric Stites some basic questions about the accolades they’ve heaped on the troubled MODE franchise brand, he threatened to sue us for defamation. According to Franchise Business Review, MODE franchisees were surveyed three times and appeared in their “best franchise” lists since 2015. We could be wrong, but we see no evidence that MODE EVER had 10 or more open and operating franchisees. * Estimated since neither MODE Founder & President Ciara Stockeland nor Franchise Business Review CEO Eric Stites will respond to questions. UnhappyFranchisee.com has obtained a copy of an email exchange between an unhappy MODE franchisee and Franchise Business Review CEO Eric Stites from the first of this month. The franchisee expressed outrage at FBR’s claim that MODE franchisees are among the most satisfied in the nation. So the ranking that is currently active and being distributed on multiple pages of the Franchise Business Review website, which proclaims that MODE has among the highest franchisee satisfaction TODAY, is based on a positive survey that taken 14 months ago while the drastically worse survey results from 2 months ago is being hidden from trusting individuals who might be considering betting the farm on the MODE franchise. Eric Stites Promised to “Take Immediate Steps to Remove MODE From Our Rankings.” Why Hasn’t He? The MODE franchisee told Eric Stites that the year-old survey was given right after the MODE franchise meeting when morale was high. Prior to the survey, President Ciara Stockeland had given a talk stressing the importance building a strong brand image for their stores by giving a positive response to the survey. Plus, with only 9 franchisees, there could be no such thing as an anonymous survey. The distressed former franchisee told Eric Stites about the devastation she had suffered after buying into Ciara Stockeland’s deceptive MODE sales pitch. Like other MODE franchisees, she had lost hundreds of thousands of dollars. After working her entire life and raising two daughters, she was now on the verge of bankruptcy. Eric Stites expressed his heartfelt sympathy. He acknowledged that Ciara Stockeland and the MODE franchise did not provide a proven model, nor the support of an experienced franchisor. Eric Stites stated that preventing such financial and personal loss led him to start Franchise Business Review 12 years ago. Let me first say a BIG thank you for taking the time to share your experience with MODE. I am so sorry that you went through this and have ended in bankruptcy. Obviously, starting any business comes with risks, but franchising is assumed to be less risky because of the proven experience of the franchisor, and the training and support you should receive as a franchisee. Franchising isn’t perfect, and clearly, a proven model/experienced franchisor and support were NOT part of your experience. The challenges that you have experienced are exactly what led me to start Franchise Business Review 12 years ago…. …we will take immediate steps to remove MODE from our rankings. Unfortunately, our 2017 Top Franchise Guide is already published and being circulated, so we can’t really do anything about that issue. So why has Eric Stites not removed MODE from the Franchise Business Review rankings and on the pages of the FBR webpage? 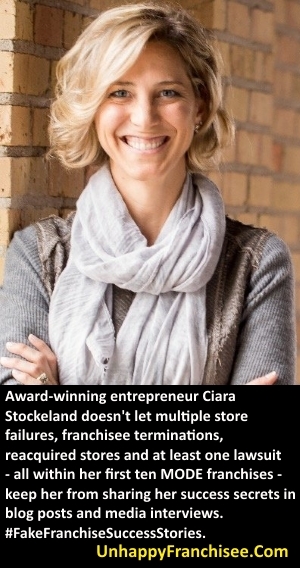 Why has Mr. Stites not notified Ciara Stockeland that the FBR award was given in error and that she must stop using it in her MODE franchise marketing and sales efforts, on her website, and in her aggressive self-promotion efforts? Should Franchise Business Review Should Sue Eric Stites for Defamation? If you’ve been following the online drama between UnhappyFranchisee.Com and Franchise Business Review, you know that Eric Stites gave UnhappyFranchisee.Com 24 hours to remove all reference to his company by high noon the next day, or his hired gun powerhouse law firm (I assume) would litigate us full of holes for defamation. We asked Eric Stites to provide examples of defamatory statements we made against Franchise Business Review. Defamatory statements are, basically, statements of fact presented as true by a person who knows they are false. One example might be, perhaps, Stite’s statement that he cares about the franchisee’s plight and is sincerely interested in preventing its reoccurrence. Or, perhaps more clearly, Eric Stite’s statement that he would take immediate steps to remove MODE’s fraudulent and deceptive satisfaction award. 28 days later, it doesn’t look like he ever had any intention to keep his word. I hope answers are coming! This is all quite shocking. Seems that if this is all true a retraction of endorsement is coming, unless MODE truly paid for the endorsement. Then FBR is in a difficult position, honor its obligation to MODE or protect its integrity. I hope to hear from FBR and/or MODE as I’m interested in the outcome. Good for you Sean, you are on the right side of this. The business model of FBR is to charge the franchisor for the survey and the promotion of the awards. How can that business model support an objective view? Franchise brokers are similar, they get paid by the franchisor, how can a franchise broker be objective if their income comes from the franchisor? Franchise Grade has a more objective business model, they charge the user for the research. That allows for a more objective perspective. It seems that FBR is unwilling to retract their award, unwilling to provide details regarding the latest MODE survey and unwilling to justify continued support for MODE. That says EVERYTHING about their practices. If the award was legit and is no longer and wasn’t paid for, the solution would be obvious.